Oak wilt is caused by an exotic fungus that was introduced into the United States from over seas. This infection is spread tree to tree by a native beetle that feeds on the spore pads of the fungus then is attracted to weeping wounds on oak trees. 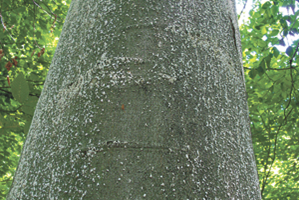 Beech bark disease is caused by an exotic scale insect that was introduced into the United States from over seas. This insect only attacks beech trees. The white "spots" seen on the smooth bark of the beech house the sap feeding insects that "tap" into the tree to feed on sap. These thousands of holes created by the scales allow fungal diseases from the ground to enter the tree. Once this happens, the tree can become prone to beech snap. Beech snap is where the tree top breaks off unexpectedly.